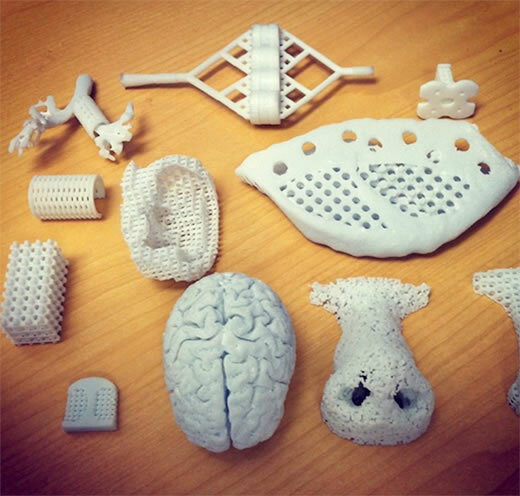 As part of the DIY revolution, Emory doctors are using 3D printers to make body parts, medical tools, training models, and prototypes. At the Emory Orthopaedics & Spine Center, sports medicine surgeons like Mathew Pombo are using 3D printers to design custom knee replacements for elite athletes during their careers and after retirement. Tissues and cells are the inks that Michael Davis, associate professor of cardiology and biomedical engineering and director of the Children’s Heart Research and Outcomes (HeRO) Center, is using in his lab. Transplanted donor valves have drawbacks, sometimes requiring antirejection medications and subsequent surgeries to replace the initial valve since it does not grow as the child ages. Davis and his team are developing child-sized valves using the patient’s own cells through Induced Pluripotent Stem Cells technology. “We want to fix the patient, using the patient, within the patient,” says Davis. Stitches and staples are effective at closing wounds, but they can also be invasive and painful and leave visible scars. Felmont Eaves, professor of plastic and reconstructive surgery at Emory and director of the Emory Aesthetic Center, has spent six years using 3D printing to transform the way surface lesions and wounds are treated.